Muster for Battle, Stand Against Darkness, and Lost in the Jungle are what you want to fight against. What you'd HATE to fight against: Grim Patron, Battle Rage, and Axe Flinger. What YOU want to play: Bloodmage Thalnos, Equality, and [card]Weasel Tunneler[card], for a tad bit of trolling. Muster for Battle's worst nightmare. This card is perfect for a control deck in the current meta, imo. With patron going, it really messes with paladins and hunters. Works even better in combination with exploding sheep. It's underrated I think, if you're facing a swarm then this can stop them dead. Let us pray they don't have owl. Face Hunter is the only reason I dislike owl. Its a 1 damage explosive trap! I actually don't like this that much, it just seems like not quite enough of an effect.Abomination is big enough and does enough damage to clear a board, this feels like it's just a bit short. Except by the time Abomination comes out, the board is sometimes already flooded with cards. 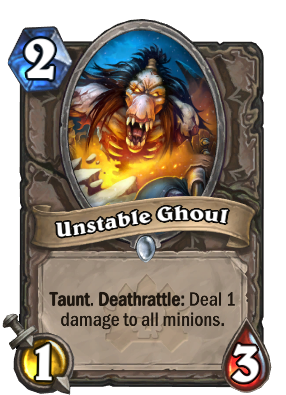 Unstable Ghoul is the perfect card to deal with the now extremely popular Haunted Creeper. 1 damage mean its enough to kill off most aggro deck creatures, but avoided triggering nerubian egg outright. Not to mention, to stop an aggro deck, the 2 extra turn Abomination need can mean 4-10+ damage already depending on how well they get their starting hands. And most current aggro decks have some plan B by then to survive. Voidwalker + Whirlwind, can't complain. Pair him up with Wild Pyromancer in a Priest deck?